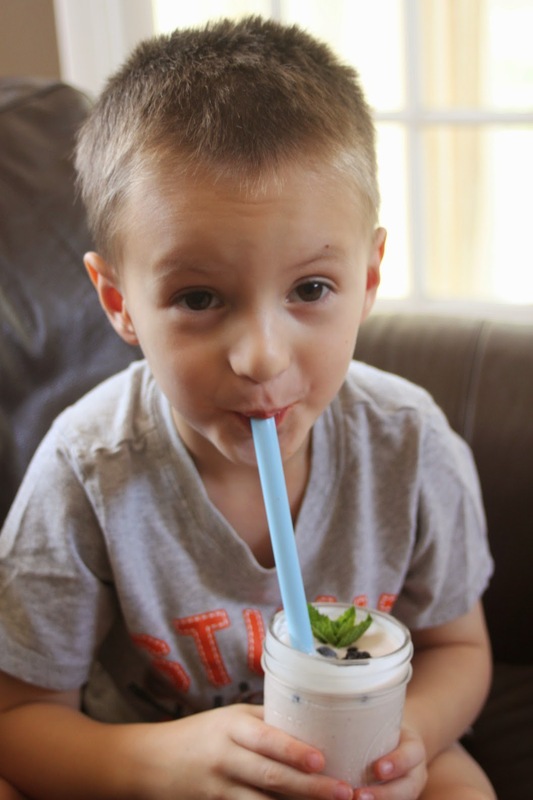 Healthy milkshakes?! SIGN ME UP! Two ingredients?! EVEN BETTER! Kids are always asking for treats and snacks, and our first instinct as mothers is sometimes just to grab the nearest package of fruit chews, chips or crackers. Today, with the help of Blue Isle Mediterranean Yogurt Spreads, I've got a new treat that's easy to make, has only two ingredients, and is super healthy and delicious! I used their Blueberry Yogurt Spread today, which is by FAR Bodhi's favorite flavor. He was eating it straight from the container with a spoon! I'm not sure this is how the folks over at Blue Isle intended for their products to be used, but I after that, I think it was safe to assume that the products are definitely kid friendly! This flavor can also be the base of a creamy fro-yo, but with nothing else but frozen bananas, you can make a great milkshake! Combine both ingredients in a blender and mix on high speed until smooth and creamy (about 1 minute). Transfer to 2 eight ounce glasses, garnish as desired and serve!